The 14th Dalai Lama, Tenzin Gyatso, was born as Lhamo Dondup on the 6th of July 1935 to a farming family in the small hamlet of Taktser in the Northwest province of Amdo, politically part of the Chinese province of Qinghai. He was one of seven siblings to survive childhood. After the passing of the 13th Dalai Lama in 1933, a search party was established to find his reincarnation. 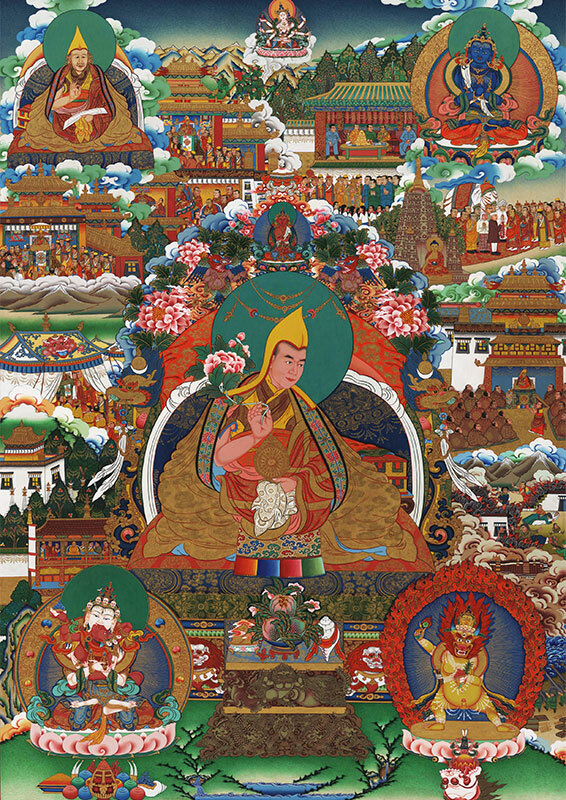 The Regent, Reting Rinpoche, had a vision at the sacred lake of Lhamo La-tso indicating Amdo as the region to search. This vision also indicated a large monastery with a gilded roof and turquoise tiles, and a twisting path from it to a hill to the east, opposite which stood a small house with distinctive eaves. The most promising child was found in such a house, as described in the vision, the house where Lhamo Dhondup lived. Lhamo Dondup successfully passed the tests that convinced the search party that he was the child they were searching for. It took two years of political wrangling with the governor of the province and a large ransom to bring Lhamo Dondup to Lhasa which he reached in October 1939. There, he was formally recognized as the 14th Dalai Lama to great acclaim, though until he reached his majority, Tibet would be ruled by a regent. In October 1950 the army of the People’s Republic of China marched into Chamdo, in Eastern Tibet. In view of the events, it was decided that the Dalai Lama would be enthroned as temporal ruler of Tibet ahead of time. On 17 November 1950, at the age of 15, the 14th Dalai Lama was enthroned formally as the temporal ruler of Tibet. The Dalai Lama’s formal rule was brief. Following the invasion, the Chinese proposed a 17 point agreement, which the Tibetan government ratified under duress in Beijing. In 1951, the Chinese army had reached Lhasa and an eight year period of uneasy cohabitation began. In September 1954, together with the 10th Panchen Lama and a delegation of several hundred people, the Dalai Lama went to the Chinese capital to meet Mao Zedong and attend the first session of the National People’s Congress as a delegate, primarily discussing China’s constitution. In 1956, on a trip to India to celebrate the Buddha’s Birthday, the Dalai Lama asked the Prime Minister of India, Jawaharlal Nehru, if he would allow him political asylum should he choose to stay. In 1959, at the age of 23, days prior to the Lhasa uprising, the Dalai Lama took his final examination at Lhasa’s Jokhang Temple during the annual Monlam or Prayer Festival. He was awarded the Lharampa degree, the highest-level geshe degree, roughly equivalent to a doctorate in Buddhist philosophy. Three Limited Editions Sets of artwork will be available to the public, all accompanied by a Numbered Certificate of Authenticity.